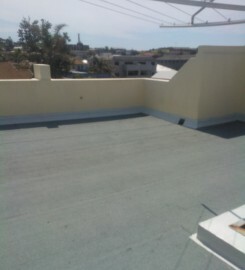 Bondi Beach Roof applied with Wrimco SBS Granule membranes. The membrane roof (over level 4 to the south of the tower block) where Wrimco SBS Granules were applied onto a concrete screed. 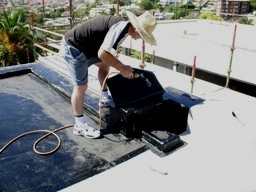 The lightweight topping was first removed and the substrate prepared with Screedbond, which is a SBR latex mixed with cement which forms a moisture/vapour proof layer to ensure no blisters. The perimeters were double detailed under the stainless steel flashings. Wrimco SBS elastomeric Elastophene Granules" being torch applied to the parking area of the shopping centre. The self-protected membrane was chosen because the concrete topping was delayed. 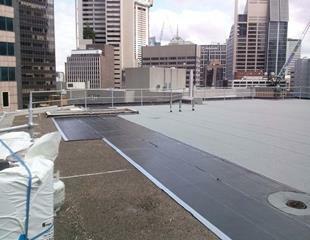 Waterproofed with Wrimco SBS sheet membrane. Wrimco SBS was used for the retaining walls (and also a tunnel connecting two buildings which is hidden from view by the PACTIV PB4, known as AMOCO PB4 at the time). The 15.3 x 1.2m strips from each bundle have been spot torched in place longitudinally prior to backfilling. The top layer was too high so was held in place with duct tape. In most cases, the void is partly backfilled to provide a platform for the next layer of SBS and PB4 so no scaffolding is required. Since the Wrimco SBS contains no solvents which often cause problems with old membranes, this sheet membrane on membrane roofs is very good for nearly all remedial work. Because the softening temperature range is 110-120 degree C, there is no problem even on the hottest day; while the granules remain strongly adhered over time, thus providing a perfect barrier to Australian sunlight. Life expectancy is in excess of 30 years. 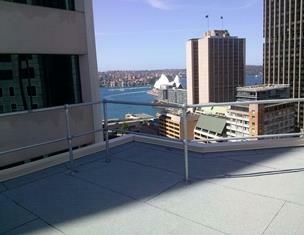 Photo showing Wrimco SBS Granule torch applied to a concrete membrane roof with a view overlooking Rose Bay. 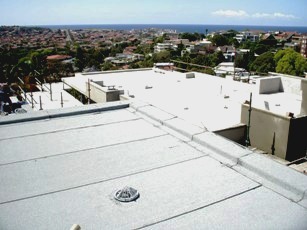 The adjacent roof on the right hand side is yet to be waterproofed. The membrane is terminated 1cm from the edge and sealed off with Duromastic AC external Acrylic. The retaining walls, roof terraces and verandahs of the ACT Magistrates Court were waterproofed with Wrimco SBS torch on membrane. Since Wrimco SBS has excellent elastic properties that are maintained at low as well as high temperatures, it was particularly well suited to the climatic conditions in Canberra. 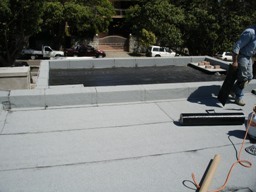 Photo showing Wrimco SBS waterproofing membrane being applied as a 2 layer system to a membrane roof. The cap sheet has 1mm factory-applied ceramic granules which provide a non-slip surface and, being inorganic, complete protection from UV radiation. The second layer is laid parallel to the first layer which has a centre stripe to facilitate staggering the joints. 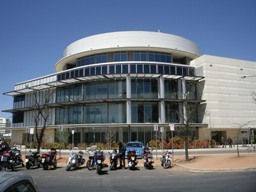 Photo showing Wrimco SBS Granules applied to a membrane roof over the Nuclear Medicine building. Note the cleats for fixing a harness to apply around the perimeter safely. Bags of fine pebbles set on top of the Wrimco SBS Granules membrane prior to being distributed. The self protected membrane and non-slip surface facilitates spreading the pebbles as well as providing fire and UV resistance. IRMA membrane roofing system with Expanded Poly-Styrene (EPS) insulation foam spot stuck to Wrimco SBS before covering it with Geotextile filter fabric and pebbles. Since there was insufficient ballast to prevent the 60mm foam from floating should the drains block from a hail storm, the foam was strongly adhered to the SBS by melting its surface with the propane gas torch. As can be seen, the parapets Wrimco SBS Granules for virtually unlimited UV protection from the 1mm ceramic chips factory applied and very strongly adhered to the SBS. Garage roof where Wrimco Waterproofing membrane was applied prior to covering with plastic grass. A feature of the Wrimco SBS membrane is the easy of the detailing can be carried out because of its 110 to 120 degrees Centigrade melting range and excellent adhesive qualities.